Hollywoods Blue King, aka Bill, was imported into the UK from Georgia as a weanling. 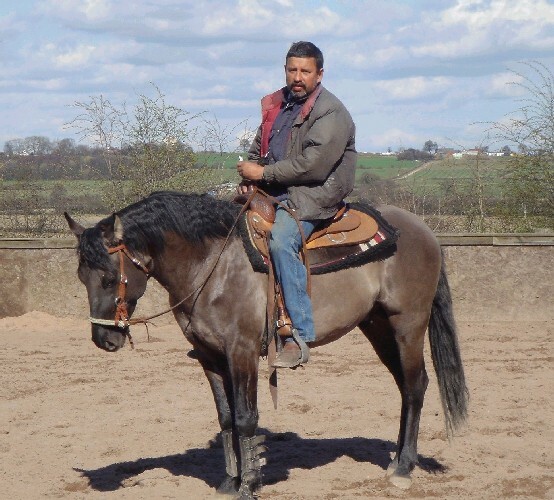 He is a beautiful pewter grullo (black dun) stallion with rare Foundation bloodlines (100% Foundation breeding), including King, Hollywood Gold and Continental King. He has the lovely easy temperament of an old fashioned Quarter Horse. Thankyou to Mrs. Anna Burns of Cotesbach Quarter Horses, Leicester, UK for sharing with us her photo of Bill, who is standing at stud at Cotesbach Quarter Horses.